This is a die-cut flange PeeGee Paint porcelain sign. 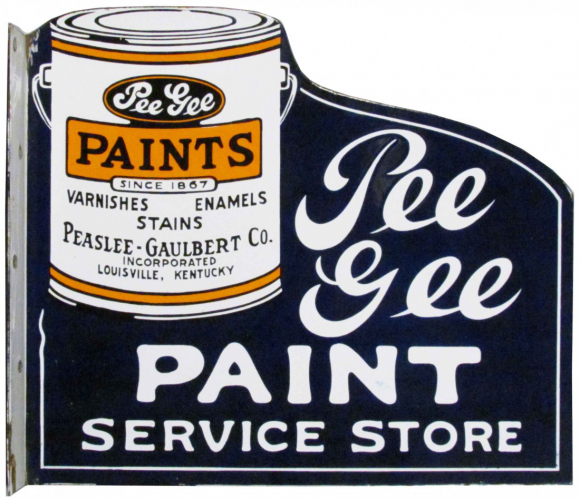 This particular Pee Gee Paint sign is preodminantly blue with white text. It reads, “Pee Gee Paint Service Store, Pee Gee Paints Since 1867, Varnishes, Enamels, Stains, Peaslee-Gaulbert Co., Incorporated Louisville, Kentucky” and features a white paint can in the upper left corner of the sign.